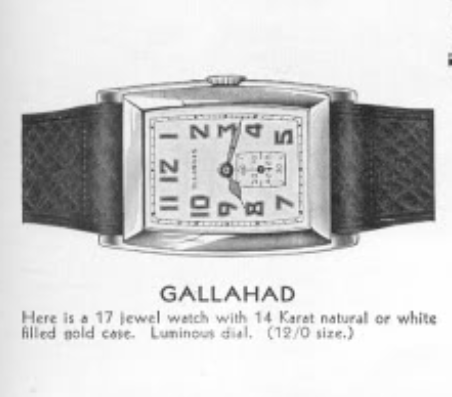 The Illinois Watch Company was started in 1870, 22 years before Hamilton got it's start. It has a rich tradition in excellent pocket watches as well as highly collectible wrist watches. In 1928 Hamilton purchased the Illinois Watch Co. for the sum of $5 million and continued it's operations until the Great Deprestion forced it's closure in 1932. Illinois didn't produce wrist watches for too long, only about 15 years, but some of their models are highly collectible and sought after. Hamilton retained the Illinois brand after closing the factory and even utilized the 17 jewel Illinois 207 movement as the basis for their new 12/0 sized, 19 jewel Hamilton 401 movement used in the Explorer series. 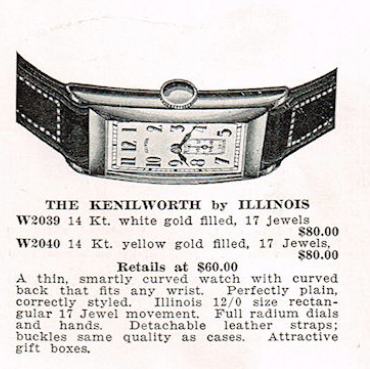 In 1930 Illinois introduced the Kenilworth. It also shows up as the Galahad. Illinois models often had slight dial variations but both the Kenilworth and the Galahad are also known by the Model 217 stamped inside the case back. Both models came in a 14K yellow or white gold filled case. I recently received a non-running Kenilworth. It would sort-of run in some positions and not at all in others. The case showed a little wear through to the edges and it was a yellowish white color - at least in my shop's lighting. Overall it was a nice example though and definitely worthy of restoration. The case is a two-piece snap together design where the case back snaps into the bezel. The bottom lugs appear to be bent inward a little bit so I'll try to straighten them to match the top. The grade 207 movement has 17 jewels and the pinion that drives the second hand is not jeweled. You can see it in the center of the movement below in a silver-colored bushing. You can compare this movement to the Hamilton 401 in the posting I did on the Andrews. On the 401 the second hand pinion is jeweled on both ends, bringing the total jewels to 19. This movement is very dirty as you can tell by looking at the dull haze on the jewel chatons (or settings). They will be a bright golden color when the movement is clean. In the shot below you can see the inside of the case back is stamped No. 217. It also has at least a dozen different watchmaker marks scratched inside. The dial is held on by two dial foot screws at 2 and 8, as you can see by the larger holes in the corners of the main plate. Now the hour wheel cannon pinion, minute wheel and setting wheel have all been removed. On the reverse, with the barrel bridge and train bridge removed you can see how the gear train transfers power from the mainspring barrel to the balance assembly. The little second hand pinion is driven independently by the third wheel. The crystal is deeply scratched up. Although it's plastic, the scratches are much too deep to be polished out so I will replace it with a proper glass crystal. Fortunately there's a readily available glass replacement. Everything is now cleaned and ready to be reassembled. The watch is running fairly well - good amplitude and fair beat error. Unfortunately it still stops when it's placed dial down so I suspect it has a worn balance pivot and the shoulder of the balance is bottoming out (and stopping the watch). So this watch will need a little more work to get right. In the meantime, here's a photo of what the finished project will look like with it's new glass crystal and a lizard-grain strap. I couldn't get the bottom lugs to open much wider but the strap fits them just fine. The watch probably should use a slightly wider strap, based on the slight gap at the top. This dial is an old redial and although I think it looks very nice, I don't think it has a totally correct pattern... However, I'm not an expert on Illinois watches so this may be a correct pattern after all. There are a lot of varieties within Illinois models.